Pokémon Go is the hottest topic in the market right now and it is something really rare among all the things that we have seen in the gaming world. In fact, Pokémon Go is having an indeed huge impact on local businesses too. Both adults and kids have developed a fond love for this game and they’re walking everywhere trying hard to catch Pokémon and most surprisingly all such users are ending up in local businesses. Huffington Post published an article recently where it tells the story of a local business firm named Mad hatter’s Ice Cream which was struggling to generate revenue and which saw a sharp increase in business as Pokémon Go was introduced. There are Gyms and Pokestops in this games where the users assemble together to catch and fight against Pokémon and it was in this way that Mad Hatter’s Ice Cream shop was located near such Pokestops. It is needless to mention that they drew foot traffic in this manner and the owner of this ice cream shop even noted that they saw its business revenue double and sometimes even triple during some situations. How can local businesses capture such foot and search traffic created through Pokémon Go? 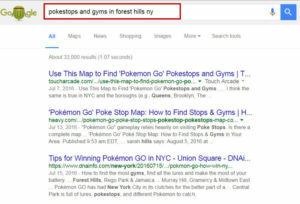 Once you know about the PokeStops which are located nearby your business, you can utilize this information within a blog post on your site and use keywords which are targeted to your personal business location. As you’re building content on such Pokestops, you’re actually meeting the requirements of the local users who are eager to learn about the Gyms and Pokestops which are located in their area. You can lead yourself to some other websites which link to you. You can locate your site to receive additional search traffic which further helps you in building domain authority, which indeed has a positive impact in terms of SEO. There are many businesses which got lucky after they became close to Pokestop but sadly enough this isn’t something which you can’t control at the present moment.